Home / Art Of War 305 / Event / Johnny Black / Lord Sparx / Event: Art Of War 305 Presents Mortal Combat (Round 1) Hosted by LMS & Hindu Rock. 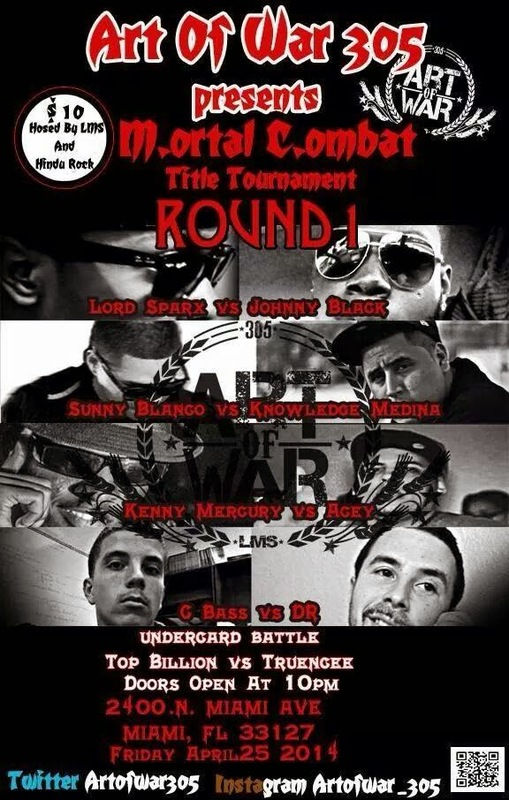 Event: Art Of War 305 Presents Mortal Combat (Round 1) Hosted by LMS & Hindu Rock. The homie Johnny Black is scheduled to return to the ring to go bar for bar against Lord Sparx this Friday, April 25th, 2014. The Mortal Combat Title Tournament round 1 will be located at 2400 N Miami Ave in Miami, Fl. Word is Lord Sparx has a youtube video where he is already claiming victory. Knowing Johnny Black, he'll be more than ready for the spar. Lord Sparx Video and Johnny Black response after the jump! This is what Johnny Black had to say in response to the video. This battle will be epic. A classic in the making.